Custom Gantt Charts for Excel is a calendar generator macro that creates colored Gantt chart style calendars from entered task names, start and end date and level. Resulting Gantt Chart calendars can be personalized and changed at will, as the are simple Excel workbook files. Different colors can be used and a deadline terminator can be selected for each task. Each task can be indented to its level or sub-level. Custom Gantt Charts for Excel will generate a new workbook with the resulting calendar. This new workbook has no macros on it - just the resulting calendar as a regular Excel file that can be changed, saved and emailed. Daily Gantt Chart Calendar Plans are calendar plans with a column for each separated day in the calendar main interval. This gives maximum detail but produces long calendars for large periods. Weekly Gantt Chart Calendar Plans are calendar plans with a column for each separated week in the calendar main interval. This gives less detail but produces compact calendars for larger periods. Automatically split: Long calendars can be split automatically to a specified number of months to produce readable and easy to print plans. 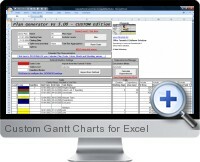 The Custom Gantt Charts for Excel can be customized. The month names, supplied in English, can be changed to match any other language. The task bars on the calendar can have selected colors and optional deadline terminator.